the trees in the 1930's and 40's were wired; in series. so the lights can be dimmed. 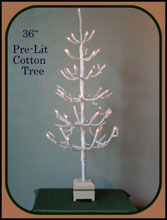 bulbs are included with the tree plus a table top dimmer.